Alia Bhatt and Ranbir Kapoor are the IT couple of Bollywood and there are rumours flying thick and fast that they will tie the knot soon after Brahmastra. While we do not know the authenticity of this information we know for certain that they are pretty serious about each other. They have been talking about their love in the press like never before. What more? Even their parents have accepted their choice wholeheartedly and have declared that they won’t mind at all if they take their relationship to the next level. They are currently shooting in Sofia, Bulgaria with director Ayan Mukherji and rest of crew and have been sharing a lot of pictures on social media. 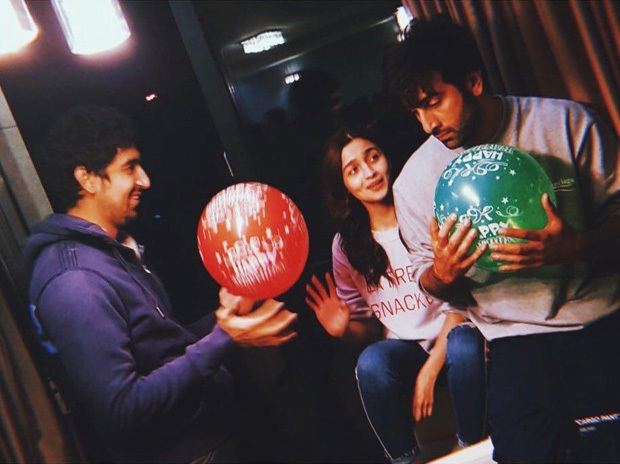 Alia took to Insta recently to share a slightly blurry but totes cute pic with Ranbir and Ayan and has titled it as Hakuna Matata which means no worries! She has captioned the picture as, “It means no worries, for the rest of your dayssss…hakuna matata.” While the photo is candid, we cannot help but notice the way she is looking at her beau. It is all LOVE LOVE LOVE for Alia as she adoringly gazes at Ranbir as if he is her one and only Prince Charming! It means no worries, for the rest of your dayssss…hakuna matata ???????? Isn’t she looking like a perfect love lost puppy? We don’t blame her too because everyone knows what a lady killer RK is! Professionally, this is their first film together. Brahmastra is supposed to be a trilogy. Ranbir’s last release was Sanju which did blockbuster business at the box office while Alia’s Raazi impressed both critics and masses equally well. Alia will be seen Karan Johar’s Kalank and Takht while Ranbir is a part of Shamshera and Luv Ranjan’s next with Ajay Devgn. Did Harshvardhan Rane and Kim Sharma just Confirm their relationship at the screening of Paltan?